LinkedIn Job Seeker Intelligence – increase your chances of being found by recruiters. Did you know if your first name is spelled differently or uniquely it can hurt your chances of being found on LinkedIn? LinkedIn doesn’t tell you this. The one exception they do make is to tell you about maiden and married names. To increase your chances of being found make sure to include the traditional spelling and in parenthesis after your name e.g. Jorge (George) Brown. Other names that may need help Jon (John), Jeff (Geoff). So if a recruiter is searching for George Brown, either way, you are covered. Notice in the results below three variations on Jeff. Make sure you can be found by location. If you live 50 miles outside of the greater Chicago Metro Area (61108), are you willing to commute? Some recruiters start their searches by screening candidates that live within a 25 mile radius of the job location. Increase your chances of being searched and found by selecting a zip code on LinkedIn that falls within 25 miles of the Chicago Metro Area (Barrington 60010). If you have experience at a specific company. Be sure to use your company’s most well-known name to ensure maximum searchabiity. An example – if you worked for the American Safety Technologies or “Signode” or Pro/Mark which are divisions of “ITW” make sure to list “ITW” along with “American Safety Technologies”, “Signode”, or Pro/Mark. 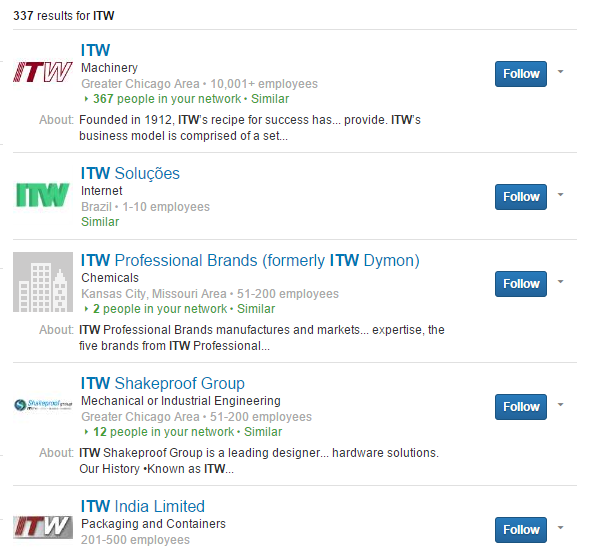 Put the (ITW) Illinois Tool Works in parenthesis you may also want to show industry as well. Notice for ITW there are 337 resultes for different divisions of ITW. Have you even looked at your LinkedIn privacy settings? Your privacy settings may play a large part in helping or hurting your chances of being easily found by recruiters using LinkedIn recruiter. You must check your privacy settings and make sure your public profile is visible to everyone. If you have a premium account make sure you have designated your account as an Open Profile which ensures you can receive free InMails and that your full profile can be seen by recruiters, and many others as well. 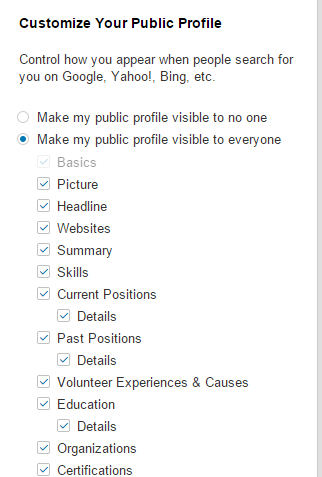 From setting public profile page choices. I’m always happy to connect on LinkedIn with people who PERSONALIZE their request. My email address is BruceBix49@gmail.com. If you find this information valuable please pass this on to others who need help.